The REINA DEL MAR was built in 1955 for the Pacific Steam Navigation Company's service to the West Coast of South America. This 20,255-ton turbine steamer,with accommodation for 766 passengers in three classes, was built by Harland & Wolff at Belfast, and launched on 7th June 1955 by Mrs H. Leslie Bowes, the wife of the Pacific Steam Navigation Company's then managing director. Watching the launching ceremony were the ambassadors of Colombia, Peru and Ecuador, and the Minister of State for Chile. Also present was Mr C. Warwick, the chairman of Royal Mail Lines, the PSNC's sister company, who turned to Mr Bowes and commented: "You know, Leslie, she'll never pay." Nor did she ! 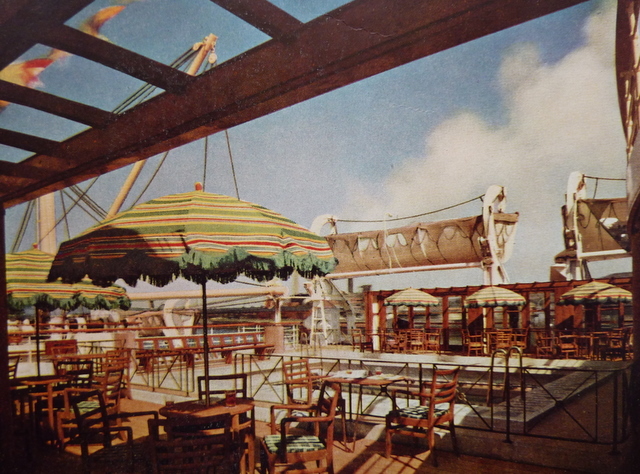 In his after luncheon speech, Mr Bowes said that he and his colleagues profoundly believed that, whatever might be the future developments in the air, there would always be a steady demand for accommodation in beautiful and comfortable ships of which, he said, the REINA DEL MAR was an oustanding example. The new REINA DEL MAR took shape as a replacement for the ageing diesel liner REINA DEL PACIFICO, on the service between Europe and the West Coast of South America. The two-finnelled REINA DEL PACIFICO did not have an enviable reputation as a seaboat, but in spite of her nickname, 'the Rolling Reina', many were sad to see her go. The new ship was designed to sail from Liverpool, via European ports and the West indies, through the Panama Canal to Ecuador, Peru and Chile. The accommodation was air-conditioned, and she had Denny-Brown stabilisers. Her public rooms were pleasant, if unremarkable; her speed was a moderate 18 knots, and her early career followed a routine pattern. She seemed all set for a quietly successful life on the Valparaiso run. 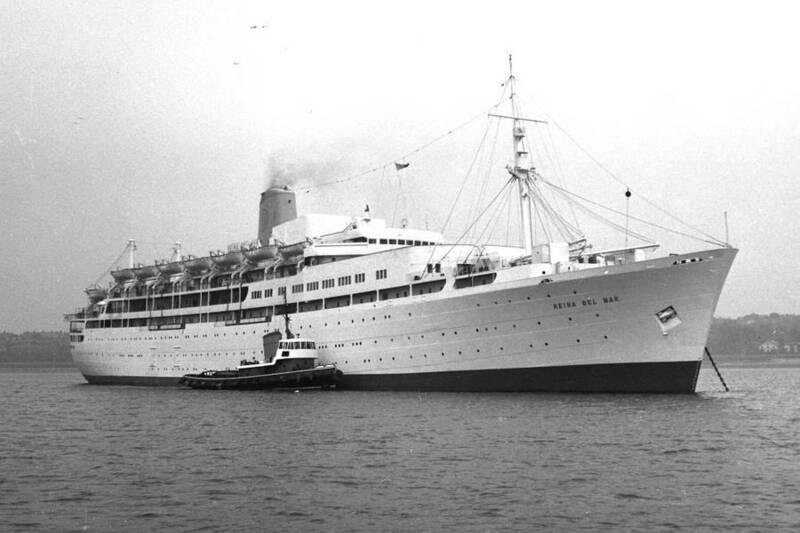 The REINA DEL MAR arrived at Liverpool for the first time on 9th April 1956 and eleven days later sailed on a pre-maiden voyage three-day cruise to the Western Isle of Scotland. By coincidence, on that same day, Friday 20th April, the new EMPRESS OF BRITAIN left Liverpool on her maiden voyage to Quebec and Montreal. 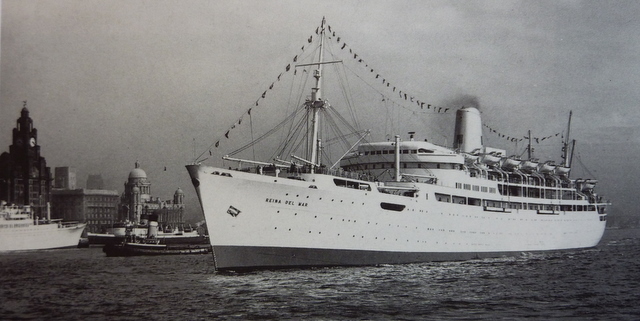 The new REINA DEL MAR left Liverpool on Thursday 3rd May 1956 on her sixty-five day maiden voyage to the West Coast of South America, calling at some 38 ports en route. On her arrival back in Liverpool on 7th July, her master, Captain George Rice, reported that: "she handles beautifully and steers like a yacht !" At that time the Reina's chief engineer was Mr A. Currie, and so it was inevitable that the new ship quickly became known as the 'Currie and Rice boat' ! The new ship operated with the REINA DEL PACIFICO as her consort until the latter was sold for scrap in 1958. The 1950s boom filtered away towards the end of the decade as long-range airliners grabbed ever higher percentages of the passenger trade. Political troubles in Cuba, for many years a major stopover and an important source of revenue, added to the difficulties. With the missile crisis of John F. Kennedy's presidency, the end of the West Coast of South America passenger run was in sight. PSNC Archivist John Lingwood aptly summed it up: "the sonic boom of jet travel sounded the death-knell of passage by sea." During these early years, the new 'Queen of the Sea' rarely found herself in the news. An interesting group of passengers sailed in her in 1962: half a dozen young climbers heading for some of the great Patagonian peaks. This group included Chris Bonnington and Don Williams. In 1962 a call at Port of Spain, Trinidad, was added to the Reina's schedule to provide a fast passenger service (eleven days) between the UK and the southern Caribbean island. 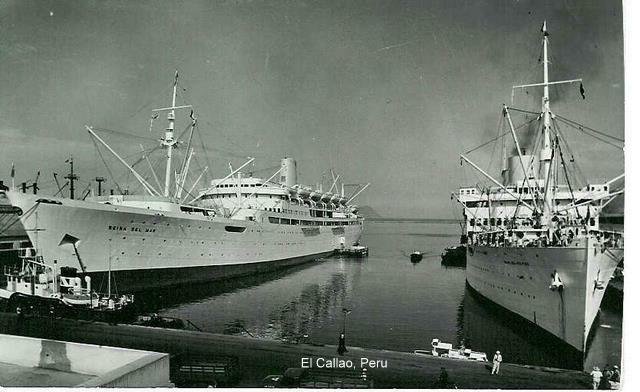 together at Callao, Peru in 1957. 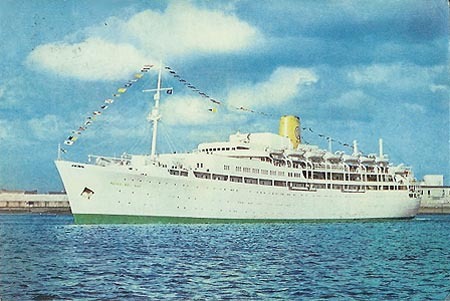 Rumours circulated in the spring of 1963 that the REINA DEL MAR would leave the South American service for a time and go cruising. 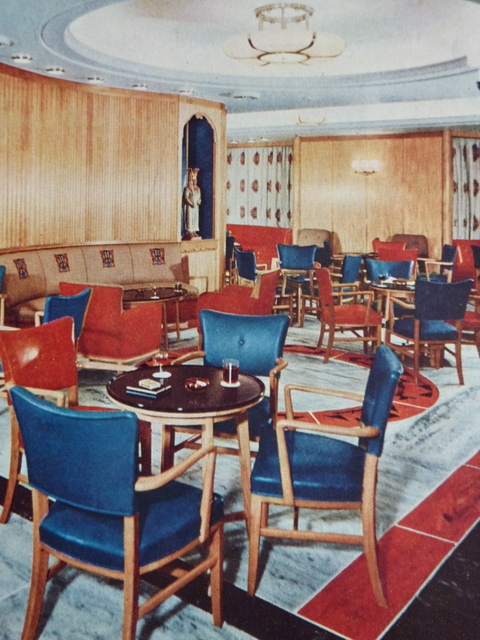 A single cruise from Liverpool had already been arranged for August of that year, with the staggering result that after the booking had been open for only a matter of hours, every one of her berths had been filled. Half of the passengers on the cruise had paid between £50 and £60 for the fortnight's voyage to the sun, which worked out at 2.5d (1p) per sea mile ! On 2nd May 1963 confirmation was received of a five-month charter in the summer of 1964 to Travel Savings Ltd., a cheap cruise scheme owned jointly by South African businessman Max Wilson, the Union Castle Line and Canadian Pacific. Members of the Travel Savings Association (TSA) could join an eighteen-day cruise to New york for just £45. 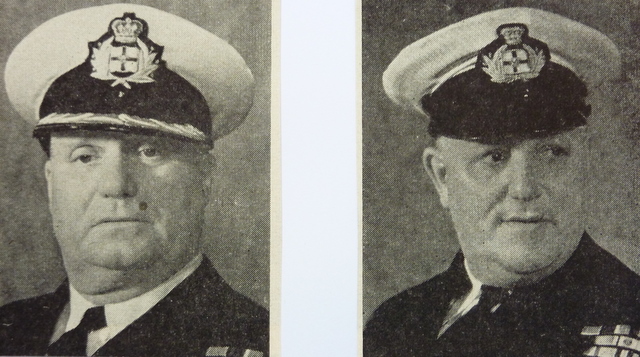 In October 1963 Mr J.J. Gawne, a director of the Pacific Steam Navigation Company at Liverpool, gave details of the long battle his company had fought in an attempt to retain the REINA DEL MAR. The Government was asked on several occasions for a grant to save her on the Mersey to South America passenger run as 'a symbol of British craftsmanship'. "The REINA DEL MAR has been running at a loss," explained Mr Gawne, "and we felt we must stop the drain. Representatives of the Foreign Office and Ambassadors pleaded with us not to take the 'Reina' off the South America run." Few liners have been involved in as complex a situation as the REINA DEL MAR during 1963 and 1964. There was a change of plan in September 1963 and the Reina found herself sailing into stormy waters. Max Wilson and his TSA were to buy her as their first ship; when she came into their hands in the Spring of 1964 for a little over £3 million, the first task was an expensive conversion. At this juncture, Royal Mail Lines, PSNC's parent company, acquired 25% of TSA shares, an equal holding with the other members. 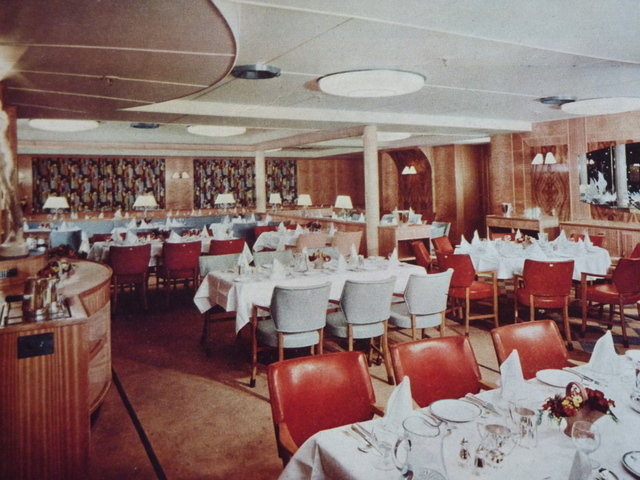 TSA's first cruise, employing the EMPRESS OF BRITAIN, took place in the summer of 1963, and a notable feature was the low average age of the passengers. When Max Wilson announced his intended purchase of the REINA DEL MAR, he spoke enthusiastically of the progress made by his scheme. "This is only the beginning," he said, "to date we have sold 26,000 berths - roughly twenty-six shiploads of passengers. Bookings are coming in at a minimum of 1,000 a week. Our membership in Britain is over 30,000." cruising for the Union-Castle Line. In November 1963 a powerful controversy sprang up over the decision to resell the REINA DEL MAR to the Greek shipowners A.J. Chandris. Flying the Greek flag, and manned by a Greek crew, she would be chartered back to TSA for her lifetime. Chandris would become a fifth equal shareholder in TSA. Sir Nicholas Cayser, the then TSA chairman, pointed out that the organisation was primarily a sales concern and not a shipping company, and was not geared to operating a cruise ship on a complicated itinerary. Ambitious plans were announced. With an increase from 770 to 1,150 in her passenger capacity, and with new public rooms and facilities, the REINA DEL MAR would be well equipped for her new role as a full-time cruise liner. A sixty-day voyage from Durban to Japan for the Olympics was scheduled as a curtain raiser. The National Union of Seamen was equally vocal. NUS General Secretary William Hogarth said: "Here is a clear case for government action to halt such sales of British ships abroad for use in competition with our own ships. At first glance, this is tantamount to condoning flags of convenience." The TSA Board, contentedly watching their enterprise through rose-coloured glasses, were more than a little taken aback by the angry and persistent attack on them. Just when the unions were putting great pressure on the Max Wilson group to keep the REINA DEL MAR under the British flag, the Greek liner LAKONIA caught fire and sank with heavy loss of life. At the end of February 1964, while the REINA DEL MAR herself was making a farewell voyage to Peru and Chile via the West Indies, Florida and Panama, the decision was taken not to sell her to Chandris. A new consortium, comprising PSNC (with a holding of 25%), Canadian Pacific, British & Commonwealth Shipping (Clan Line and Union Castle), and Max Wilson's TSA became the new owners of the REINA DEL MAR. The liner had been incurring losses on the West Coast of South America service, running at between £200,000 and £300,000 a year, and in her eight years of operation, she had never made a profit. With Captain D. Idris Jones in command, the REINA DEL MAR left Liverpool on 2nd January 1964 on her last scheduled voyage on the service for which she had been designed. 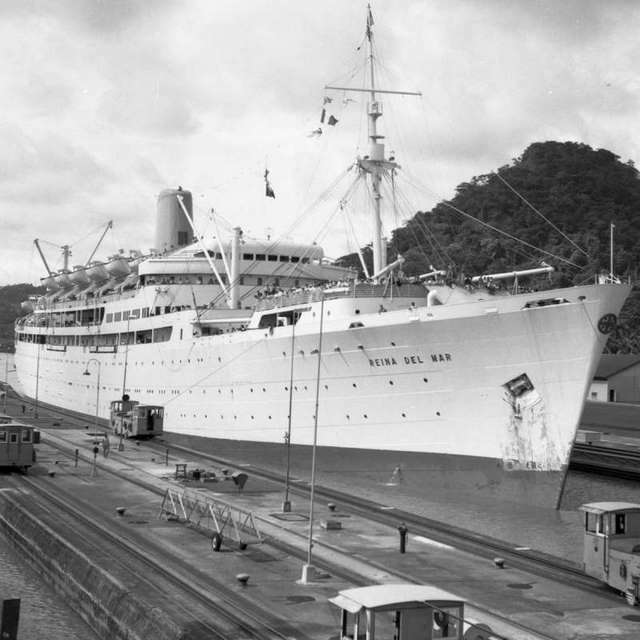 On 10th March the Reina arrived at Belfast for conversion into a one-class liner at a reported cost of £500,000. Her cargo space was converted into additional passenger accmmodation, and she was ready for sea again on 10th June when she sailed on an eighteen-day cruise from Liverpool to New York. Some 700 TSA members were on board with tourist-class fares ranging from £45 to £75. The REINA DEL MAR retained her familiar yellow funnel but carried the initials TSA in blue, inside a black circle. However, the Travel Savings Association was foundering, and in July 1964 Max Wilson's scheme for cheap cruises was dropped. In October of that year Union-Castle acquired all the TSA shares and the REINA DEL MAR reverted to PSNC ownership. For the next nine yers the REINA DEL MAR operated as a full-time cruise ship on charter to the Union-Castle Line. The charter was due to expire in September 1974, but in November 1973 it was announced that Union-Castle had purchased the Reina outright from Royal Mail Lines, the parent company of the Pacific Steam Navigation Company. In mid-June 1974 there came a surprise announcement from Union Castle to the effect that the REINA DEL MAR would be withdrawn from service in April 1975 because of greatly increased operating costs.The tremendous increase in the price of fuel played a major part in this decision, though no doubt crew wages and the cost of maintenance and repairs also contributed. The fact remained that this fine ship, only eighteen years old and very popular with the British cruising public, was unable to pay her way. 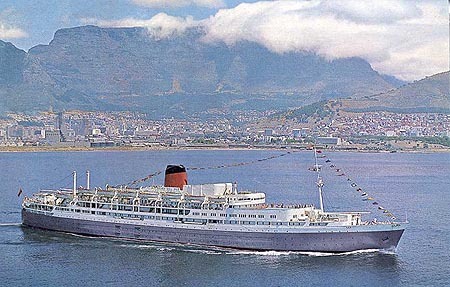 The REINA DEL MAR completed her 1974 U.K. cruising programme and then sailed for Cape Town where she operated her 1974/75 series of cruises from South Africa to South America. Following her return to Southampton the REINA DEL MAR was laid up on 1st April 1975, and eight weeks later she sailed for the shipbreakers at Kaohsiung, Taiwan.